But a three-thousand-mile journey in 1837 is fraught with danger for anyone, and soon Amanda finds herself recovering from near death in a trapper's cabin. His Indian wife becomes Amanda's first convert--and friend. But the trapper and his intriguing half-Indian friend want nothing to do with Christians. What a brave woman Amanda is from the very beginning of this novel. She sets out from the East coast to head out west. Her Dad and a guide come with her, but along the way both of them die! She is left alone to find her way without the help of a guide or the knowledge of survival in the wilderness. She ends up living for a short while with Jim and Mary his Indian wife while Mary gives birth to a young son. She begins her ministry with Mary, telling her about God and encouraging her to believe in him. Of course Jim and his friend Buck want nothing to do with 'her God', both having been dealt a bad hand by so called Christians in the past. Mary continues to pray and minister as she can. Circumstances lead Mary and Amanda on a trip continuing west to Amanda's destination, with Buck as their guide. Buck begins to have feelings for Amanda and vice versa, but she knows she could never marry an unbeliever. This novel is full of opportunity for Amanda, and for us to see God's hand in on her and those she comes into contact with. I love the way God uses her, a young woman without a lot of real courage on her own, but full of courage when God is at the helm. If you like historical fiction you will really enjoy this book! 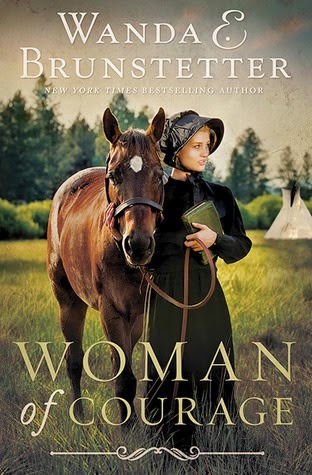 Wanda Brunstetter is well known for her Amish fiction books, and I have enjoyed this spin off based on a Quaker woman.